If you’re like me, you probably feel that summer and fresh seafood go hand-in-hand. I’m fortunate to live near an actual coastline, so the clams we get are often straight off the boat, but considering how quickly food is transported these days, you can find fresh, briny-tasting clams just about anywhere. Be aware of the vendor selling you the clams and if he’s reliable, you’re good to go. As I say in the recipe note, don’t skimp on the parsley. It helps to “make” the dish and if it’s fresh from your garden or the farmer’s market, all the better. When I travel in Italy, I order this over and over and am never disappointed. You can skip the thyme if you want, but don’t skimp on the parsley. And just before serving be sure to finish the dish with extra-virgin olive oil. My best advice for this is to be sure to start with a big enough pot for the clams, zucchini, and pasta. Trim the ends of the zucchini, slice in half lengthwise and cut into 1/2-inch-thick half-moon slices. In a large sauté pan with a tight-fitting lid, heat 2 tablespoons of the oil over medium-high heat until shimmering. Reduce the heat to medium-low and cook the shallots and garlic, stirring, for 2 to 3 minutes or until tender. Raise the heat to medium and cook the zucchini and thyme for about 5 to 6 minutes or until the zucchini is just tender. 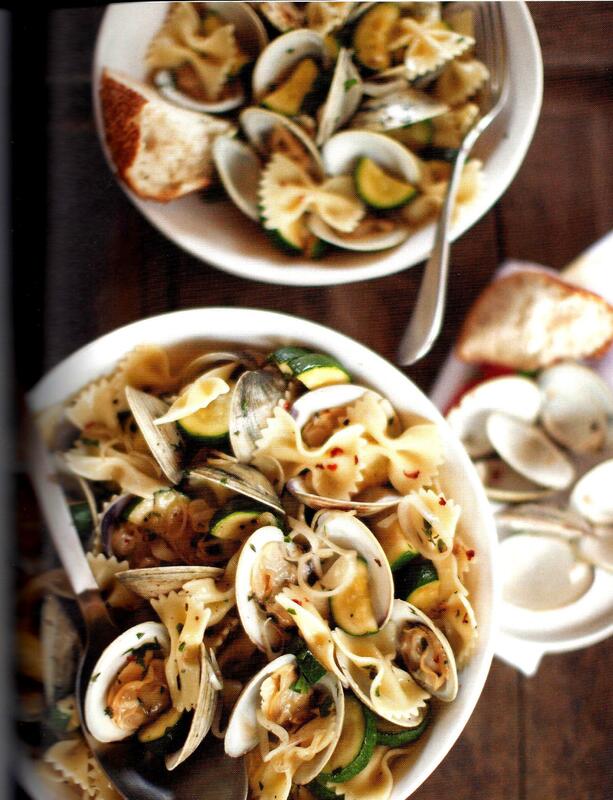 Add the clams, clam juice and white wine, cover tightly, and cook over medium heat for 4 to 5 minutes or until the clams open. 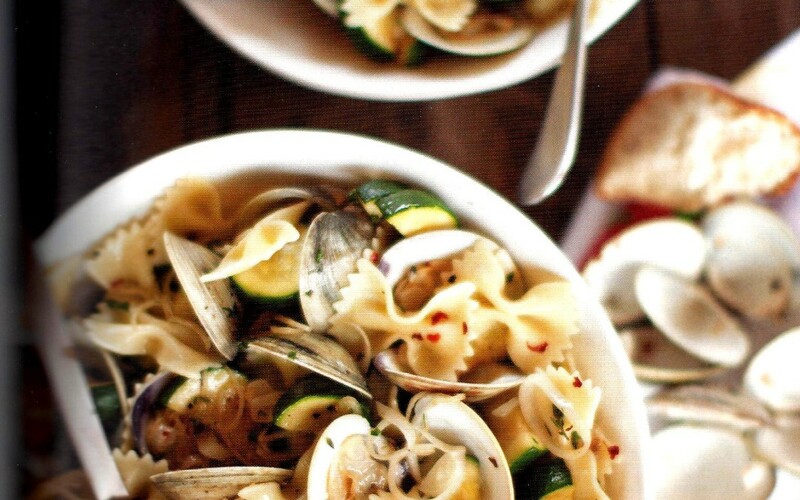 Stir the clams and zucchini once or twice during steaming. Meanwhile, cook the pasta according to package directions until al dente. Drain and transfer the pasta to the pan with the clams and zucchini. Add the remaining 1/4 cup of olive oil, butter, chili flakes, and parsley and toss gently medium heat until the butter melts and the ingredients are nicely mixed. Season to taste with salt and pepper.